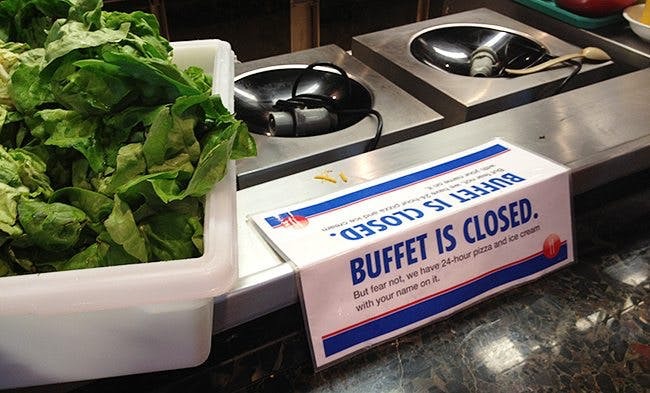 Here’s a sign from the cruise, when the buffet was closed (like in the middle of the night). There was always – always – food around. But what kind of food? Considering the body constitution of ordinary Americans on the cruise the sign is ironic. This is exactly the kind of thing they ought to fear. 24-hour pizza doesn't help the situation, but it's actually a distraction from the real problem.... most of the overweight people i know TRY to amend the situation, but the advice they've been receiving for the last 40 years has been very literally counterproductive -- a low-fat diet with plenty of healthywholegrains and fruitsandvegetables (juices) CREATES fat. until America is convinced that wheat is toxic, excess fructose creates NAFLD, and industrial seed oils damage every cell in their bodies, nothing is going to change. taxing sugar or banishing fast-food ain't gonna accomplish nuttin'. Fast food availability is not the problem. The problem is the endless hunger created by the high levels of circulating insulin created by the advice to avoid "arterycloggingfat" and eat more "hearthealthywholegrains." If you're in nutritional ketosis in the middle of the night (as you should be), you don't suddenly wake up thinking, "Hmmm. Some pizza and icecream would be really good right now." "...taxing sugar or banishing fast-food ain't gonna accomplish nuttin'." Before my husband and I discovered low carb diets, we were very careful to follow the "guidelines" for healthy eating - 1% milk, whole grains, chicken without skin, steamed vegetables, orange juice (with pulp), etc., fast food only a few times a year. It wouldn't have made any difference to us if there had been a 24 hour Burger King in our living room. And unlike a lot of people, we never ate fake low fat products - I hated those from the very beginning. Yet we managed to each gain 50 pounds and we were always hungry. What did we snack on since we were always hungry? Rice cakes of course. Whole grain, unsweetened, fat free and only 30 calories each, but with a glycemic index of 77. It's the bad advice creating the hunger creating the demand for convenience foods - not the availability of convenience foods luring people to consume when they're not hungry. Pizza is a vegetable in America, Andreas. Didn't you know that? It has a little tomato-paste spiked with HFCS, so obviously the entire pizza must be healthy! It's the height of what Pollan calls nutritionism, right? Since people have this habit of thinking - they have been trained into it - they can't help but use it. :) So it's all healthy - pizza is a veggie, ice cream is a "healthy" calcium source, made from "real" milk. And this is logical, given nutritionism. moreporkplease - Do you know what happens when schools serve other vegetables and require kids to take at least one on their lunch tray? The kids put them in the trash, either at the end of lunch or before sitting down. I have no idea if there's anything that can be done about that. I'd rather see "tacos" with plenty of meat, shredded cheese, sour cream and salsa served on a lettuce leaf. They might not eat the lettuce, but at least they wouldn't be eating taco shells. But if it got out that they were serving real cheese and real sour cream, not to mention real meat, the National Guard would be sent in in haz-mat suits to remove it. I am SO happy not to be constantly hungry any longer, I spent my first 46 years of life being obsessed with a food. Now I am eating within 6 - 8 hours window. If people need a pizza or ice-cream at night, that it is something wrong with them. I also never understood the concept of a bed-time snack, even in my low-fat days. This is standard for cruises. I've been on a few, and in the past have indulged in late-night pizza and ice cream both. If only we could have a 24-hour roasted chicken station. In emergeny situations, when nothing else is availible, buying a pizza with lots of LCHF-friendly topping and only eating them and not the crust is a option. Here in Sweden we have kebabsallads at all pizzerias so that's what I choose in those situations. Give me an example of emergeny situations, I can imagine doing so only in a social setting. "The kids put them in the trash"
I hear ya. When I was a child in school, the lunch monitor wandered the room telling us all to eat our veggies and clean our plates. Of course my grandmother until she died in the early 90s was still pulling out "clean your plate, children are starving in China," because she remembered the rationing of food during WWII. My friends are starting to have kids now and it's amazing - they seem to feed them what they themselves longed to eat as a child, not what the child actually wants or what would be good for it. Recently I heard from my friend that she wasn't going to "fight" with her kids over food anymore, she was letting them eat whatever they wanted. She keeps her house filled with orange juice and frozen pastries, so of course that's what they eat. Even the 4 year old can microwave frozen chocolate croissant. So in her house everyone lives on chocolate croissant. It's amazing - she has abdicated her role as "mom," it seems to me, so she can be her kids' "friend." I guess that way she can avoid having to be responsible or admit she herself is a grownup. I think many mothers are just too tired to care anymore and give up too easily. :( The schools can't be expected to fill the gap; parents have to teach and enforce better eating habits. Yeah, I used to get the "starving children in [insert country of the moment]." When I would ask how my eating food I didn't want would help people without food thousands of miles away, the next sentence would be "No dessert for you!" This happened so often that I would just shrug it off and to this day I never expect to have dessert! My son wanted to eat only sugar and sweet things when he was a small child. So then I cleared my house from everything but normal products(cookies, candies, cheeps, cereal bars) that required cooking and tried to feed him 3 times a day without snacks, he also used to grab some cheese or cold meats from the fridge, or ate sour-cream with a spoon. It was much better than eating a sugar with a spoon. At school or in friends houses he could eat whatever. He is 19 years old now, lean and muscular, without a sweet tooth. When he is too busy in university to do normal cooking, he eats only stakes - says that one stake is cheaper than a cafeteria meal, tastes better and takes 5 minutes to cook. The irony is that if you adopt an LCHF diet, you don't need 24 hour food availability. If you can't find anything to eat, it's actually bearable to just wait until tomorrow! #8 Some small towns here in Sweden only have a pizzeria and no other kind of restaurants, so your choises migth be very limited. Don't even think about buying a burger in this country. If you want a real burger you have to make them yourself, otherwise Burger King is the best you can get. We can't escape food. When I was a a child in the 50s most TV ads were for cars and cigarettes, now 2/3s of the ads are for food, so people get food images often. Food used to be in grocery markets, now food is literally everywhere--even the underwear departments in Macy's, the drug store, every gas station. It's insidious. Marketers spent billions to figure out how to addict people to junk, and it worked. Even for those who are well informed it can be a challenge to turn off the urge to eat when faced with such a constant barrage of food enticements. I am hearing calls to stop the junk food marketing to kids, but I suspect it's not going happen any time soon. Just note that there is an average of seven commercials at every commercial break; add up that time and it means people watching an unexpurgated version will see many minutes and a couple dozen food commercials. I feel like I am in battle mode every time I leave my house; and only watch programs I prerecord so I can zip through the junk. "There are sober children in Africa." oh, Alexandra, that's RICH!!! :-D gonna have to steal THAT line!!! "...now food is literally everywhere..."
A few days ago a Facebook friend posted a picture she took in the - erm - "ladies' products" section of the supermarket. Right there between the Always and the Kotex was a display of Reese's Peanut Butter Cups! Galina L. You nailed it!!! Experiemnts on other mammals have clearly shown that eating outwith a 6-8 hour window during the day if diurnal or during the night if nocturnal also helps control weight. Given the same calories animals that are allowed to eat continuously will put on more weight than those that are limited to a narrower feeding window. This is the role of relaxation and sleep as well in controlling weight.